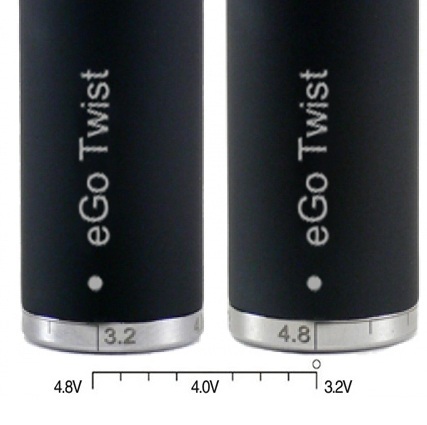 eGo Twist Variable Voltage Battery is another advanced vision based on the eGo original battery. 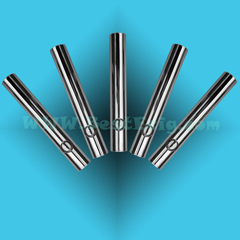 The circuit has been modified to enable adjustment of the output voltage from 3.2V to 4.8V. 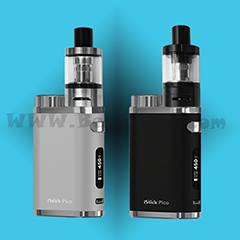 With a smart Buck-Boost converter inside, you can twist the knob dial at the end of the battery to adjust the output voltage to your requirement. 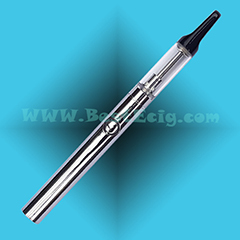 You can twist it from 3.2V to 4.8V, which means that you can change the temperature at which your juices are atomized. 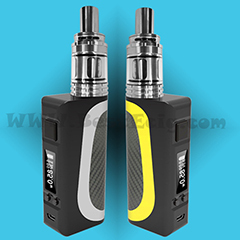 Changing the temperature at which juices are vaporized can dramatically change the flavor, and make the weakest juices have fuller flavor, and can lighten a heavier tasting juice. 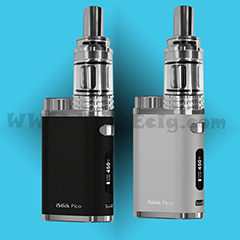 Sometimes changing the voltage can change the flavor of the juice completely. --1). 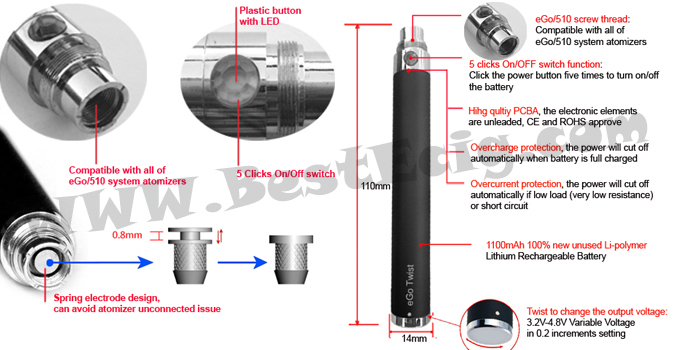 True 3.2V-4.8V Variable Voltage in 0.2 increments setting: A simple twist can change the voltage from 3.2 volts to 4.8 volts, this adjustability is a benefit for the eGo-C user, as it is simply a fact that different atomizers work more efficiently at different voltage levels..
--2). 5-click safety cutoff: click the power button five times to turn off the battery and five times again to turn on the battery. This is a very convenient option if you typically carry your electronic cigarette in your pocket or purse. --3). Short Circuit Protection: When a short is detected, the battery will shutdown until the short is removed. --4). Battery Monitoring/Over-Discharge Protection: The device will monitor the battery voltage and automatically turn off when the battery is discharged, preventing damage to the battery by overly depleting it. The LED will blink 5 times indicating that a charge is need. --5). 510/eGo Threaded:: Completely compatible with the eGo series atomizers/ cartomizers/ clearomizers. Full battery can keep for :about 8 hours. 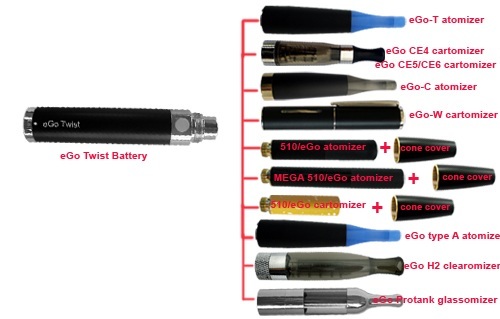 What atomizers/cartomizers can used in eGo Twist Variable Voltage Battery? 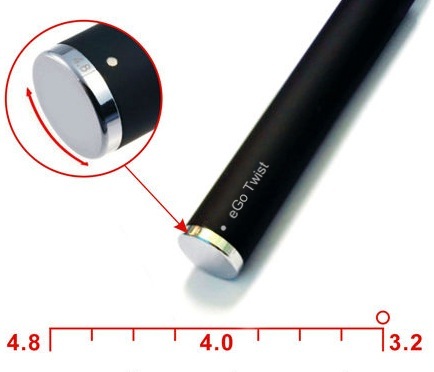 The e-cig eGo Twist Variable Voltage Battery is completely compatible with the eGo series atomizers/cartomizers/clearomizers, can work in eGo-T atomizers, eGo CE4 cartomizers, eGo CE5 cartomizer , eGo CE6 cartomizer, eGo Mini Protank Glassomizer, eGo H2 Clearomizer, eGo-C atomizer, eGo-W cartomizers, 510 atomizers, eGo atomizers, 510 MEGA atomizer, eGo MEGA atomizers, 510 cartomizers, eGo cartomizers, eGo type A atomizers. --2. 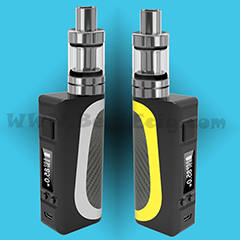 Set Output Voltage: Output voltage range: 3.2-4.8V, you can twist the knob dial at the end of the battery to adjust the output voltage to your requirement. --3. 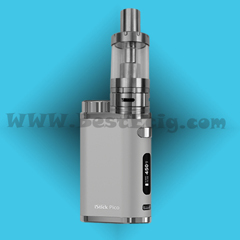 Work: screw and connect the eGo Twist Variable Voltage Battery with the atomizer/cartomizer/clearoimer of eGo, eGo type A, eGo-T, eGo-C, eGo-W, eGo CE4/CE5/CE6, protank, H2 ect. 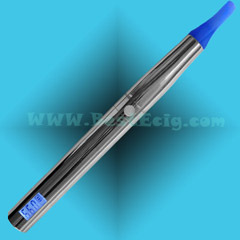 ), then they will be stand-by state, it works only when you press the eGo Twist power button. Press the LED power button and inhale at the same time. 1), When the power LED indicator flashes, it means low battery. 2). You just screw the eGo Twist battery with the USB charger, then plug it into the PC or AC-USB Adapter. 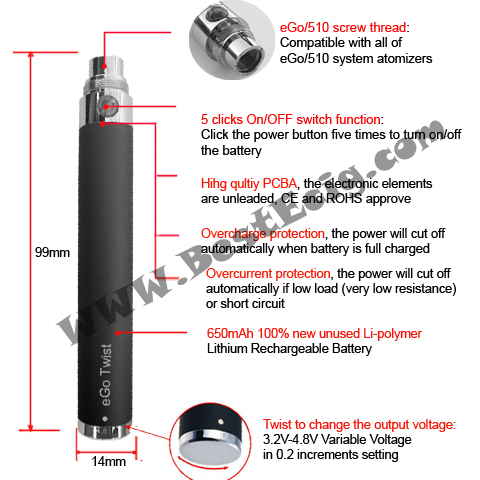 *Tips: All of eGo series batteries: 650mAh eGo battery, 1100mAh mega eGo battery, eGo LCD 650mAh battery, eGo LCD MEGA 1100mAh battery, eGo Twist 650mAh battery, eGo Twist MEGA 1100mAH battery) charged by the same eGo USB charger. 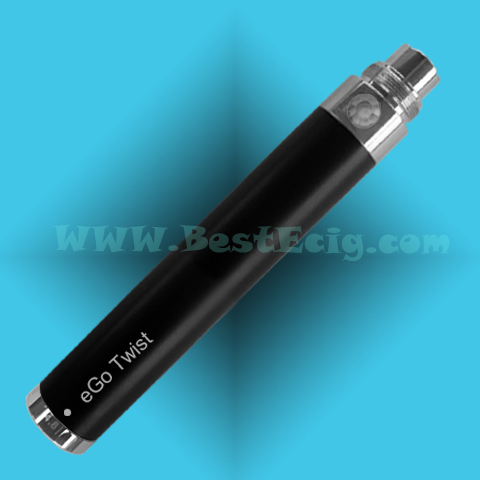 * A fully charged eGo Twist variable voltage battery can last up to 8 hours. * Best results with cartomizers ohms at 2.0 and above. * Because of the knurled dial if this is put in a pocket it can rotate on you if it catched on the fabric, so do not store in a pocket or click 5 clicks to cut off the power. 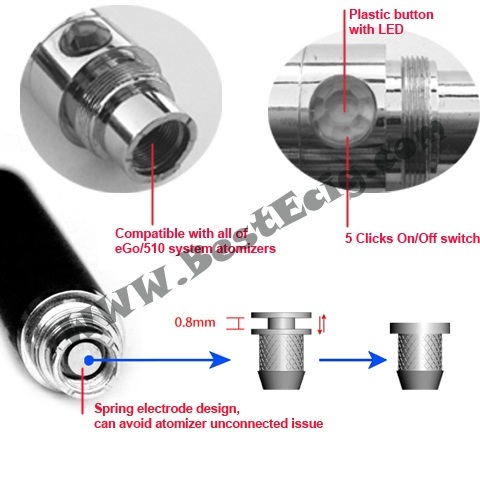 Please click for what suitable voltage to different eGo atomizer (or eGo cartomizer, eGo clearomizer, eGo glassomizer)?